financed with us. trained with general assembly. Opportunity@Work partnered with General Assembly to offer a 14 week web development bootcamp program for students who are typically underrepresented in the tech community and otherwise unable to afford education. Accepted students had 100% of their training costs financed and received $2,100 each month for living expenses. In return, students agreed to pay a portion of their income, only upon graduating and landing into a well-paying job. Programming fundamentals, full-stack web apps, and more. Learn about the program here. The training program ran from November 27, 2017 through February 22, 2018. In the future Opportunity@Work may partner with General Assembly, as well as other coding bootcamps, to offer similar programs. To learn more about future pilots or outcomes from this pilot, please check out our Twitter, Facebook, and blog. You do not have any upfront cost. You tuition is fully covered while you are enrolled in the program. Additionally, you will receive a living stipend of $2100 per month while you are getting trained and for three months after you graduate while you work on finding a job. This means you can cover ongoing expenses and focus on succeeding in the training program. You only have to start paying after you get a job, and only if you earn over $35,000 per year. Unlike a student loan, an ISA has no interest and your payments are adjusted based on your income. That means you could end up paying more or less than the full cost of the program. For example, if for some reason your salary drops from $60,000 to $35,000, your payment amount will drop as well. And if you ever lose your job or start making less than $35,000 per year, your payments will stop until you regain employment with an income above $35,000 per year. What is an Income Sharing Agreement (ISA)? In general terms, an Income Sharing Agreement (ISA) is a contractual agreement enabling an individual to receive funding in exchange for a percentage of post-program income over a defined number of years. Through this Learn and Earn program, your ISA will cover your full tuition for General Assembly’s Web Development Immersive course of $14,950. You will be required to repay 6.5% of your income for 5 years as long as you are earning $35,000 or more per year. An ISA protects students from the risks associated with loans. When the repayment period of five years is over, you are free from the agreement -- regardless of how much or how little has been paid. ISAs have no interest, and no principal amount that must be repaid. Do I need a cosigner to take an ISA? Is the income share calculated from my gross or net pay (before or after taxes)? Does interest accrue on my ISA? No. There is no interest that will accrue on your ISA. Can I prepay my ISA? You can prepay the remaining balance between whatever you already paid and $22,425. You can prepay $375 for each month you want to reduce the term length of the ISA. What happens if I’m unemployed or otherwise earning a low income during the payment period? If you are unemployed or earning less than $35,000 per year at any time during the five year payment period, you are not obligated to make any payments during that time. This does not extend your term in any way. You will be done making repayments after 5 years even if the amount that you repaid in that time is less than the tuition amount of $14,950. Are there any risks or drawbacks to participating in this program? The amount of payment is based on income, so if you commit to an ISA and earn a high income after graduation, you may pay more than the upfront tuition amount. However, the ISA caps the total amount to be paid in two ways: a) payments are capped for those making over $90,000 a year, so if you make more than that, you will still only have to pay 6.5% of your first $90,000 (about $5,850 per year); b) you can always pre-pay (see question above on pre-payment). Am I required to repay the exact funding amount I received through my ISA? No. You are obligated to pay 6.5% of your income for five years (as long as you are earning $35,000 or above). This means that you may pay more or less than the original tuition amount - depending on what you earn. What if I have to drop out after enrollment? If you drop out during the pre-course training (‘Vestibule’) period or within the first 2 weeks of class, you will not have any repayment obligation. After the first 2 weeks and until you are 60% of the way through the course, your obligation will be prorated based on how much of the course you completed. For example, if you complete only 50% of the course, you will repay 6.5% of your income for 50% of the time (i.e., 2.5 years instead of 5 years). After you complete 60% of the course you will have the full repayment obligation - i.e., you will repay 6.5% of your income for 5 years - only if you are earning $35,000 or above. If you drop out of the course - no matter at what point - you will no longer receive the living stipend of $2100 per month. How will I keep track of my ISA? A third party provider, Lumni Corporation, is a secure, student-friendly ISA application and servicing partner. Lumni provides a simple online portal and student managers to help you with your ISA every step of the way, from sign up through repayment. The Lumni portal is where you'll go to keep track of funding, disbursements, record keeping, and repayment. And Lumni's dedicated student managers are reachable by phone, email, messaging, and skype -- so you'll always have someone to turn to when you have a question. How are my monthly payments determined? Lumni’s online portal makes it easy to upload and submit the documentation we need to calculate your monthly payments. Your monthly payments are determined by informal documentation (such as a paystub from your employer) which is used to approximate your annual income. This estimate of your annual income is divided by 12 to set your monthly payment amounts. You will also be required to submit copies of your tax return each year; the income on your tax return for a year determines your final obligation for that year, and the difference between your total monthly payments and your final obligation will be reconciled at that time through a “true up” process. What is the living stipend and how does it work? Separate from the ISA that covers your tuition, you will receive a living stipend of $2100 per month while enrolled in the training program and for three months after graduation to support you during your job search. The living stipend of $2100 per month is not expected to be repaid and is not part of your ISA. We are covering this to make sure that you can focus on succeeding in the training program and in your job search without having to worry about basic living expenses. Do I have to repay the living stipend? No. We provide the stipend of $2100 per month to cover living expenses throughout your training and job search so you can focus on striving towards your success. You will receive the living stipend for the three month duration of the course, so long as you remain enrolled. You will also receive the $2100 per month stipend for three months after graduation or until you get a job after graduating (whichever is sooner). Will I be able to receive the stipend if I don’t have a bank account? Yes, we can issue checks to each student. What will I learn in GA’s Web Development Immersive (WDI)? Develop a back-end web application and APIs using a modern programming language and MVC web development framework. Develop a dynamic front-end to your application using a modern framework used to create single-page apps, such as Angular or Backbone. Consume web APIs from third-party sites like Twitter or Yelp. Write secure applications and deploy them to cloud services like Heroku. Collaborate within a team using an agile development workflow and collaboration practices in Git. You will receive a certificate of completion from General Assembly, a company that has trained thousands of students and helped them launch a career in web development and programming. You will also receive coaching on your resume and portfolio to showcase your professional skills to employers. Do I need a laptop to participate in this program? Yes. This course requires a laptop. If you do not own a laptop, General Assembly will provide you with one for the duration of the course and job search period (a total of six months). Is parking provided at the GA campus? Parking is not provided at the GA campus. However, each month you will receive a $100 transportation stipend that can be used towards public transportation or parking. Is General Assembly’s campus Metro accessible? Yes. General Assembly’s campus at 1133 15th St NW, Washington DC 20005 is a 5-7 minute walk from both McPherson Square Station (Blue and Orange Lines) and Farragut North Station (Red Line). Is this a full time program? Yes. Classes are held from 9AM to 5PM every day. Additionally, students typically remain on campus from 5PM to 7PM to complete homework assignments with support from teaching assistants. Who are the potential employers? What employers are in General Assembly’s network? 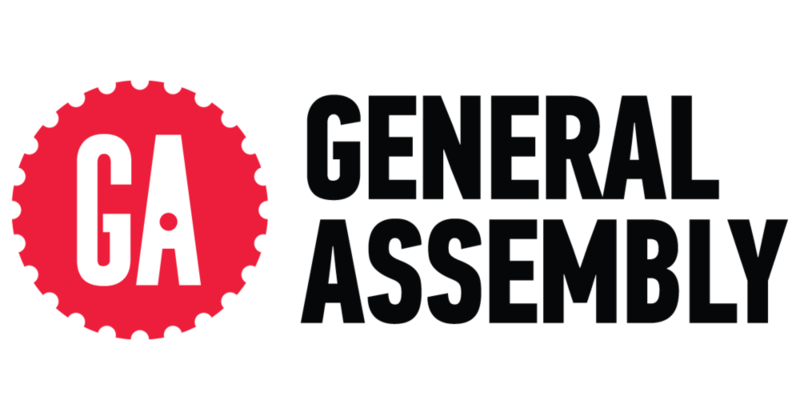 General Assembly’s Web Development program is well known in the local community of tech employers. Past graduates have been hired by local companies such as Booz Allen Hamilton, Capital One, and Deloitte. Additionally, students have consistently been hired by government agencies and local startups. How can I prepare/what should I do if I have never coded before? The admissions process includes a coding tutorial and then, upon acceptance, you will begin 40-50 hours worth of coding pre-work before you start your program. No prior coding experience is necessary. Outcomes are the career support team that works with students throughout any full-time or immersive program. They get to know each student and provide career help from day one. WDI is taught by web developers that have chosen to come out of the industry to be educators for some time. Some of our instructors have gone through WDI themselves. What is the alumni network like at GA? The alumni network is already at 50,000 and growing. Students are all part of the GA community and often come back for workshops and events. There is also always a Slack channel of students-turned-developers to continue learning from. How much time will I spend on assignments outside of the 9-5 class? Most students stay on campus after class for an hour or two. You'll also need about 5-8 hours each weekend to work on your projects.